Many factors are important for a healthy retirement – staying physically active, maintaining close relationships and pursuing personal goals. However, one factor is vital to make the others all possible: a healthy diet. Without considering healthy eating, you cannot fully benefit from a rewarding and engaging retirement, and increase your risk of a range of health issues. As people age, the amount of calories they need to consume each day reduces as the amount of good quality nutrients they need increases. This makes it difficult to ensure they’re getting all the vitamins and minerals they need each day, since you’re typically eating less. That’s also why it’s all the more important to choose foods rich in nutritional content. Poor nutrition can put you at risk for a number of health issues that could interfere with a happy retirement. A poor diet increases the chance of developing hypertension, diabetes and heart disease. Additionally, nutrient deficiencies can affect mobility, weaken bones and muscles, and can contribute to cognitive issues. Greater amounts of specific nutrients are required to help keep the body and mind strong during retirement, such as minerals for strong bones, fibre for a healthy digestive system and protein for cognitive health. In addition, it’s also important to eat balanced amounts of fruits and vegetables, healthy fats and complex carbohydrates, as well as lots of water to stay hydrated. Daily consumption of vital nutrients and minerals can have a significant impact. Aim to eat fruit, veg or salad at each meal in the day and to eat a rainbow of coloured salad / vegetables on your plate at your main dinner. If every person ate five to 10 servings of fruit or vegetables each day, the cancer rate could drop by as much as 20 per cent. 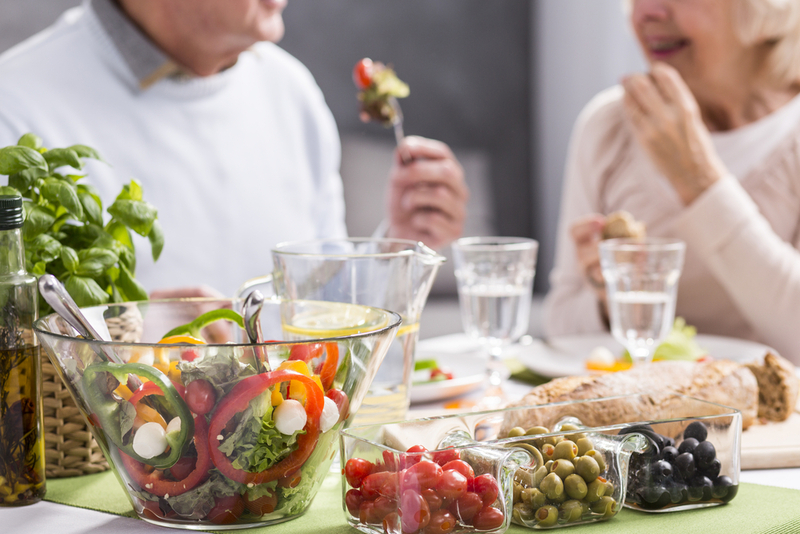 The key to following a good diet throughout retirement is making healthy choices a habit by fitting them into daily routine. Keep to a schedule of three balanced meals per day, plus healthy snacks as needed. Set small, incremental goals to improve their diet, such as choosing to eat one more fruit or vegetable each day, or to eat fish once a week. Variety is key. This helps keep eating interesting and ensures you get a good variety of nutrients. Ease up on the extras like butter, cakes, cheese and other saturated fat foods which contribute to excess calories. Include them less often and in smaller portions. Careful that alcohol intake is not creeping up now that you are not working. Aim for a few alcohol free days and watch portions. Try to consume a non-alcoholic beverage between drinks to help slow you up. Finally enjoy your food! Now that you have more time on your hands you might like to experiment with cooking and find your inner chef! Inside Out Nutrition Ltd. takes great pride in working with Retirement Life www.retirementlife.ie to deliver nutrition workshops to help staff change nutrition habits for good into retirement. Our Registered Dietitians can deliver 1 hour workshops which take you through the important nutrients needed in your retirement. Workshops are practical and engaging which encourages people to retain the information and put into place in their own homes.